Wanting a little more warmth in your Inversion Glove without sacrificing grip, breathability and comfort? 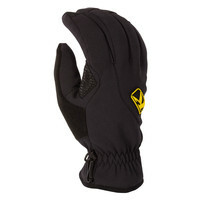 Look no further than the Inversion Insulated Glove from KLIM®. This glove combines the original Inversion’s 100% WINDSTOPPER® shell with 60 Grams 3M™ THINSULATE™ Platinum insulation on the top-of-hand for just enough warmth. A slip-on cuff makes riding in the Inversion Insulated quick and easy.